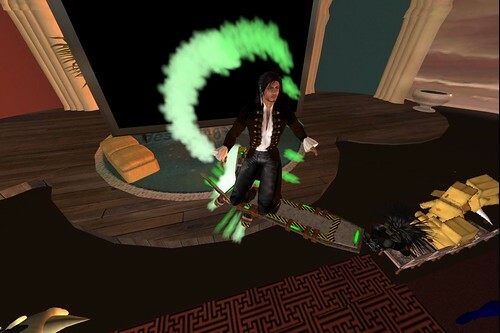 « Designing Worlds starts a new season with the most extraordinary avatars in Second Life! In this episode we did something we have long been promising ourselves as a treat – we visited the fantastic avatar store Grendel’s Children and the Avaria region that surrounds it. The store itself is remarkable – and so too is the four sim region of Avaria where it is located: a place where people can try out their new avatars – and also where they can play a range of fascinating games created by the Grendel’s team, ranging from space surfing (which Elrik had the opportunity to try out on the programme) to interactive games involving the Kobolds … oh, you’ll just have to go and visit! Saffia and Elrik were joined on the show by Flea Bussy and Toady Nakamura, two of the creative genii behind Grendel’s (or, as they like to refer to themselves, the Janitors). 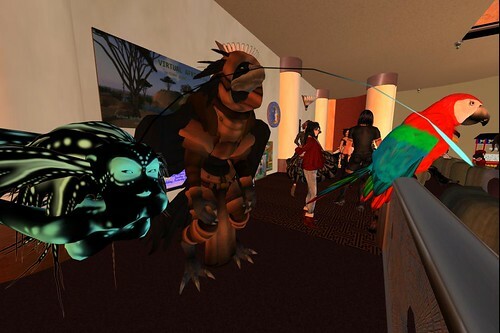 We explored inside the store and the sims around, and had the chance to see a stunning range of avatars thanks to loyal followers of Grendel’s, who donned some astounding forms and appeared as extras. And Saffia took the opportunity to test out some new appearances as well … a beautiful sea kelp siren and, strangest of all … well, you’ll just have to watch the programme – we’re not spoiling the surprise! This show was certainly a strong start to the season – and our studio was packed for the live broadcast – with some of the most extraordinary avatars that we have ever seen! In addition, there’s a beautiful display of Grendel’s work to be found in the Exhibition Hall at the front of our studio – make sure you don’t miss it!